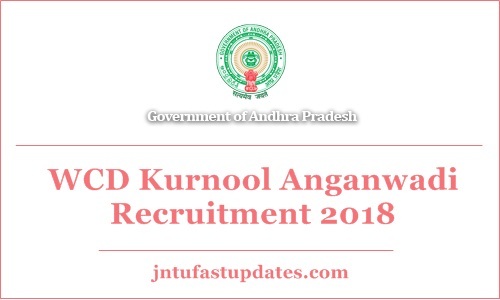 Kurnool Anganwadi Recruitment 2018: Women & Child Development (WCD) Department has released a recruitment notification for 248 Mini Anganwadi worker, Main Anganwadi worker and Anganwadi helper posts. The WCD is presently accepting applications from interested and eligible aspirants. Interested aspirants can apply through online at kurnool.ap.gov.in. The application process was already started from 17th November. Eligible candidates can send their online applications through Kurnool WCD website before 26th November. Candidates interested in WCD Kurnool jobs can go through the details of WCD Kurnool Anganwadi recruitment 2018 details from the following. Women & Child Development (WCD) Department, Kurnool, Andhra Pradesh is the state government organization that works for the rural and child development. The organization issues various job notifications every year to hire the suitable aspirants into various posts. The WCD Kurnool released the notification for 248 Anganwadi posts. The posts include Mini Anganwadi worker, Main Anganwadi worker, and Anganwadi helper. Candidates applying for WCD Kurnool must have the minimum educational qualification of 10th class/matriculation. Candidates must have the minimum 21 years and maximum of 35 years. Age relaxation will be offered as per the category of the candidates. Applicants will be shortlisted through written test and interview rounds. Candidates shortlisted for Kurnool WCD Anganwadi posts will get the pay scale of Rs.4,500 – Rs.7,000/- (Tentative). Candidates applying for WCD Kurnool must have the minimum educational qualification of 10th class/matriculation. Candidates must have the minimum 21 years and maximum of 35 years. Age relaxation will be offered as per the category of the candidates. Applicants will be shortlisted through written test and interview rounds. Candidates shortlisted for Kurnool WCD Anganwadi posts will get the pay scale of Rs.4,500 – Rs.7,000/- (Tentative). Interested and eligible candidates can apply through online at WCD Kurnool official website, kurnool.ap.gov.in from 17th November to 26th November 2018. The online application form is presently accessible on WCD Kurnool official website. By clicking on it, aspirants can fill the application and submit it by attaching the required documents.